The musical Cats debuted on the London Stage back in 1981, but its innovative premise makes it timeless. While the music by Andrew Lloyd Webber is definitely “memorable,” it is the cat choreography by Gillian Lynne that sets the show apart. The entire cast commits to the feline mannerisms, and Lynn's use of jazz and ballet elements in the choreography complete the illusion. Cats is really a series of vignettes based on a book of poems by T.S. Eliot: Old Possum’s Book of Practical Cats. Equal parts cat opera and ballet, the vignettes are only loosely tied together by storyline. This makes the show hard to follow at times, so reading a synopsis before hand is recommended. 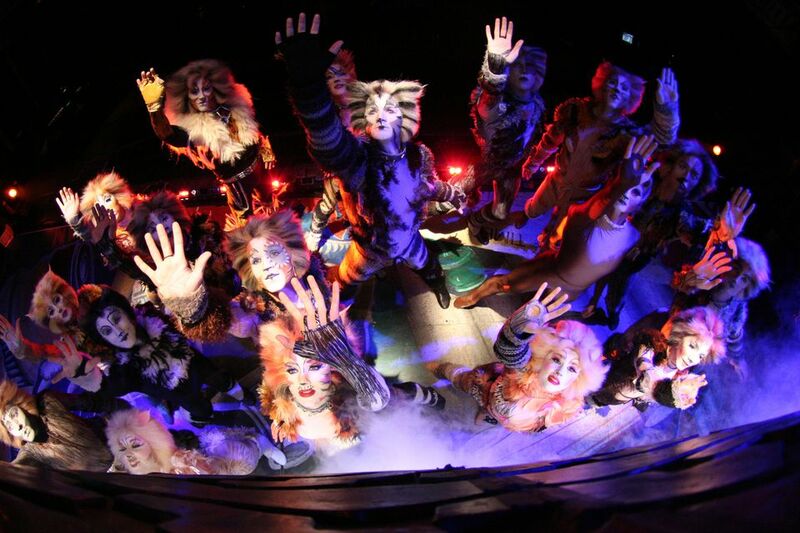 The show opens on a junkyard, where Jellicle Cats are uniting for an annual celebration: The Jellicle Ball. As the cats gather, they notice the audience (thereby breaking the fourth wall) and set about explaining what sets the Jellicle breed of cats apart. As it turns out, Jellicle cats have three names. The first name is what humans call them, the second name is used by other cats, and the third is kept secret. In fact, each cat spends its lifetime(s) contemplating it, which explains why cats so often seem to be meditating. The cats are waiting for their group's elder, Old Deuteronomy, for the ball to begin. It seems Old Deuteronomy will choose which cat will ascend or Journey to Heaviside Layer to be reborn. This decision sets the framework of the story. What follows is a series of auditions (or vignettes) by various cats in the gathering, including Jennyanydots, the Old Grumbie Cat; Rum Tum Tugger, a mischievous lothario; Bustopher Jones, a fat cat of high society; Asparagus ("Gus"), the has-been Theatre Cat; and Skimbleshanks, the Railway Cat. Throughout the night Grizabella (aka The Glamour Cat) makes repeated appearances. The bedraggled “cat” of the night seeks acceptance by the other cats and to be considered by Old Deuteronomy. She is repeatedly spurned by the group, but Old Deuteronomy ends up witnessing a moment wherein Grizabella reminisces about happier times (Memories). Another cat that pops in from time to time is Macavity, a sinister, evil cat who is angry at not being invited to the ball. With the help of his two henchmen, he kidnaps Old Deuteronomy. When he returns to the group dressed as Old Deuteronomy, he is discovered, fights the other male cats, and finally, electrocutes himself when trying to escape. When the commotion is over, however, Old Deuteronomy is still missing. Enter stage left the magical Mr. Mistoffelees, the Conjuring Cat, who uses his magic to bring Old Deuteronomy back. Given that the 2010 National Tour of Cats essentially utilizes the direction, choreography, set and costumes of the original Tony-Award-winning production, it is hard to find fault. Of course, Richard Stafford, the tour’s director/choreographer should also be credited. In the case of the set and costumes, they were reproduced from the original designs of John Napier, the Tony-Award-winning designer. The result is an exceptional showcase for a large, talented cast. While the special effects are at times distracting and the words of T.S. Eliot's poems sometimes hard to discern, the beautiful music, innovative choreography and multi-talented cast make the production well worth seeing. The true star of the 2010 tour is the casting director, who managed to not only find actors who could both sing and dance, but who could emote a loose, feline grace through body language and mannerisms. The cast was simply phenomenal, and each cast member was used to their talents and strengths in each scene. Two of the standouts in the cast are Michigan natives Anastasia Lange and Adam Steiner. Lange plays Grizabella and sings the show-stopping Memories. Lange is made up to look like Gloria Swanson in Sunset Boulevard, but it is her body language that conveys just how world-weary The Glamour Cat. While she was spot on when singing snippets of the famous song throughout the show, it was Lange's final, lung-wrenching rendition of Memories that produced an emotional response and jaw-dropping awe. Adam Steiner is originally from Detroit and attended Western Michigan University. His portrayal of Rum Tum Tugger, the mischievous cat lothario, stole the show. He seemed to channel Tim Curry as Frank N. Furter from The Rocky Horror Picture Show, while his hips channeled Conrad from Bye, Bye Birdie. His playful personality, however, was all his own. Nathan Morgan was great as the old, palsy-plagued Asparagus (“Gus”) and the larger-than-life Tigergrowl. He skillfully managed the acting transition from worn-out theatre has been -- complete with aged voice and shaking paw -– to the younger version of "Gus" playing Tigergrowl on stage. His singing voice was strong and rich, and he was absolutely playful and charming in the role. The entire show takes place in a one-set junkyard. The hodgepodge of trash fits together in such a way as to provide a variety of levels and convenient hidey-holes for the cats. The special effects were sometimes a distraction in the show. For instance, the tire that ferries Grizabella to Heaviside was "propelled" with so much smoke and light that it appeared more like a flying saucer abduction than spiritual ascension. Additionally, the fog sometimes drifted out into the audience and obscured the action on stage. With the exception of Growltiger’s Last Stand, the choreography was amazing, especially given the limited confines of the stage and the sheer size of the cast that was present during most of the scenes in the show. There were times in the show when the high notes of songs sounded shrill. It was unclear whether this was due to feedback from the sound system or the high "cat" pitch. It was also hard to hear the T.S. Eliot poetry that served as both lyrics to the songs and book to the show. This made the already barely there storyline even harder to follow. While the show is meant to be interactive, the cats only come out to the edges of the audience on a couple of occasions, and the one time a cast member came out to dance with a member of the audience – Rum Tum Tugger – the moment was awkward. Aside from special-effect lighting that was angled a little too directly into the audience, shiny streamers were the only other part of the production to leave the stage. What's Portland Like for Lesbians? Which Top National Pizza Chains Started in Detroit?